Great selection of indoor table tennis tables in the UK. Lowest prices. All with free delivery! We stock a great range of the very best indoor table tennis tables available to buy in the UK today. The majority of our indoor table tennis tables are foldaway or rollaway allowing them to be stored neatly away after use. Indoor table tennis is easy to play for complete beginners and all of our tables are also suitable for intermediate and some even for professional play. They provide great entertainment for all the family and are a good way to keep the kids active. All the indoor table tennis tables come with extended warranties so you can be sure you'll be enjoying your table for many years! Also we offer a wide range of table tennis buying guides, table tennis tricks and skill sheets, table tennis rules and how to maintain your table tennis table fact sheets in our resources section part of the site. These are completely free to download and use at your leisure. We specialise in only the very best table tennis manufacturers, these being Butterfly table tennis tables, Cornilleau table tennis tables, King Pong table tennis tables and RS Barcelona table tennis tables. All of these table tennis manufacturers offer what we believe to be the very best in manufacturing and quality available to buy in the UK today. 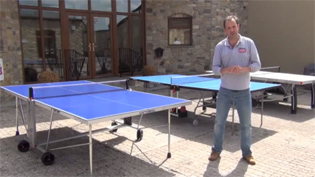 The foldaway or rollaway table tennis tables are proving very popular as they offer superb gameplay along with the ease of being stored away when they aren't being used. All of the table tennis tables to buy on our website come with a selection of free accessories so you have everything you need to set the table up and get playing as soon as it arrives. All of our table tennis accessories are of a high quality to match the quality of the table tennis table purchased.